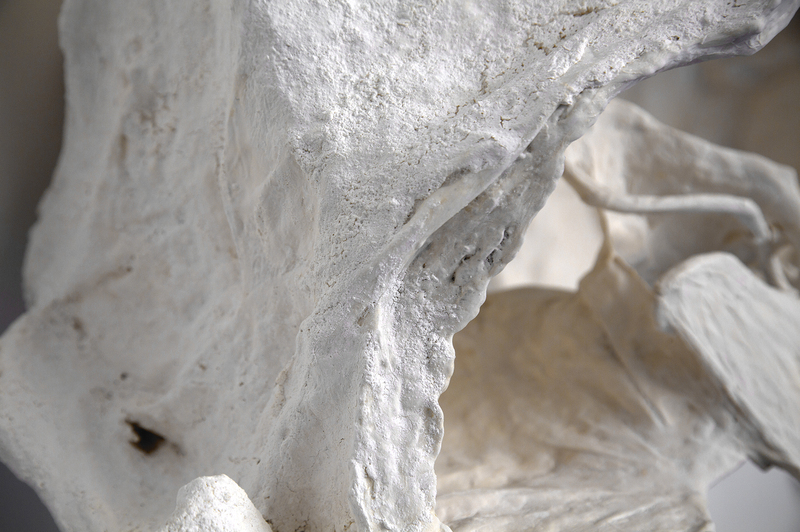 Created by the artist, this material is made of the same substances as human bones (hyaluronic acid, calcium carbonate...) and its protein base is replaced by plant protein. The underlying aim is not to have any transfer of genetic information in the final work. CaCO3; C3H6O3; MgF2; Ca3(PO4)2; C35H49O29; C59H90O4; (C6H10O)n.
Like bones, 68% of coral is made up of calcium. 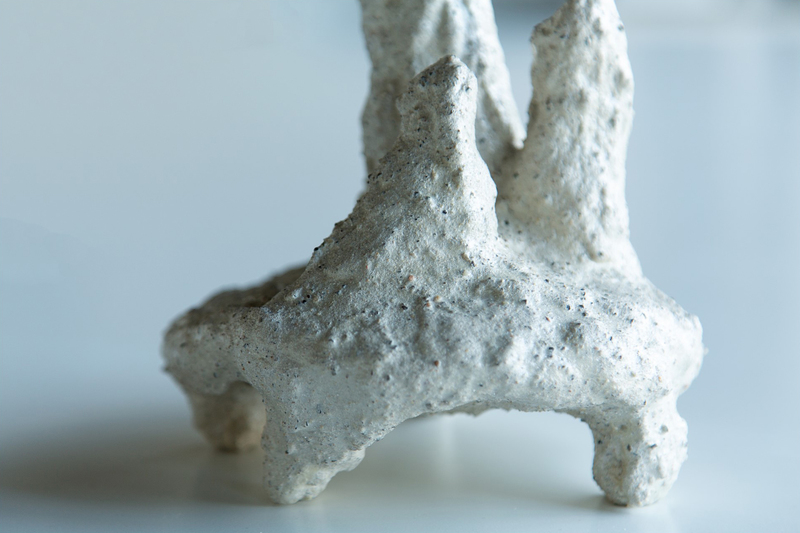 In fact, this material is created from “plant bone” material on a sculptural base. By retaining the same calcium base, the material undergoes a mutation to become coral skeleton. Thanks to a chemical reaction between plant-based starches and mineral oxides, a corrosive reaction is triggered, like that of water on a coral reef in a natural environment. CaCO3; Ca10(PO4)6(OH)2; C35H49O29; (C6H10O5)n; KAl(SO4)2; (C6H10O5)n.
This material is made up of the substances which cause candidiasis to proliferate in the body (sugars, yeasts, starches). A component that is latent yet ever present in the human body, when necessary, candidiasis intervenes in defence of the organism, but if its function does not fulfil the aim, its action becomes degenerative and invasive for the organism. 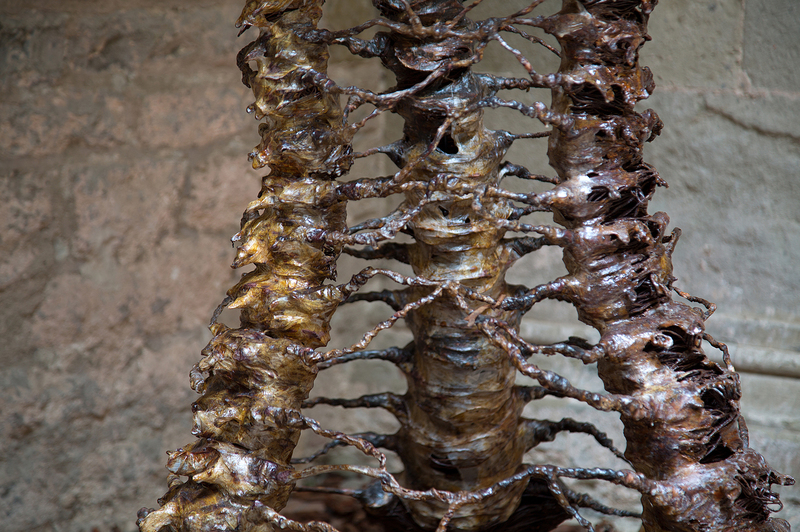 The material recounts a physical process, reaction and mutation of something static which prepares itself for change. C35H49O29; (C6H10O5)n; C12H22O11 ; (C6H10O5)n; C2H5NO2 . 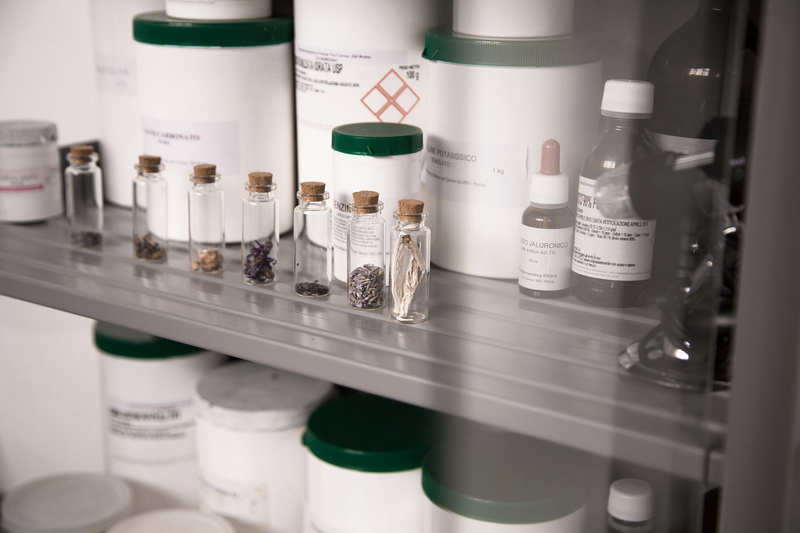 In collaboration with Prof. Dr. Mario Marazzi, (Senior Consultant of Cell Tissue Therapy at Niguarda Hospital), some tissue samples – new skin prototypes – were selected through different processes. 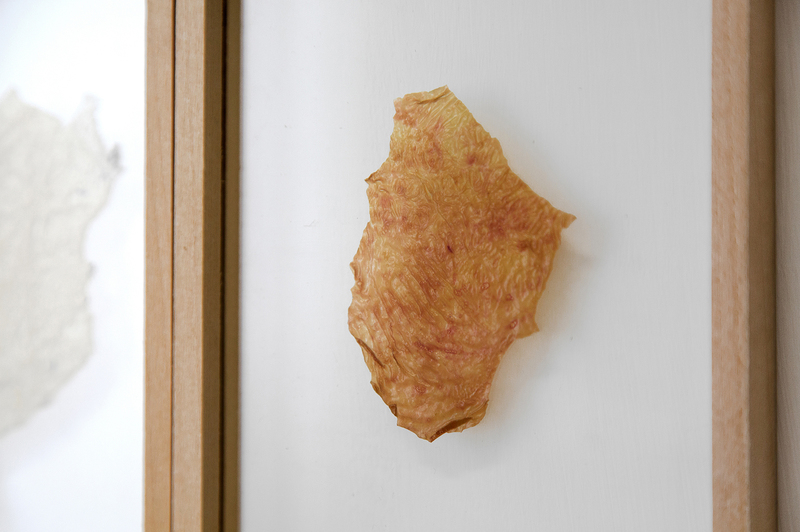 Skins in cellulose created from bacterial culture and processed in two different ways, using the traditional method of natural dyeing after exsiccation. Soy skins, the result of maceration and subsequent processing by cooling. Fibroin skins (made in the same way as silk, this material is used for biomedical purposes). Made up of clastic sedimentary rock (comprising clay) of differently sized granules. Clay (clastic rock of extremely fine granules) becomes active when in contact with water, presenting molecular behavioural patterns which modify the structure of its material. These processes can be seen as a metaphor of systems that are very similar to those occurring in a social environment. Thanks to various combinations of differently sized granules and aggregating materials, combined with the support of vegetable fats, various final finishes are created. 26Fe; SiO2; 13Al; SiO4; K(Mg,Fe2)3[AlSi3O10(OH,F)2; Kal2(Si3Al)O10(OH,F)2; A3Si2O5(OH)4. 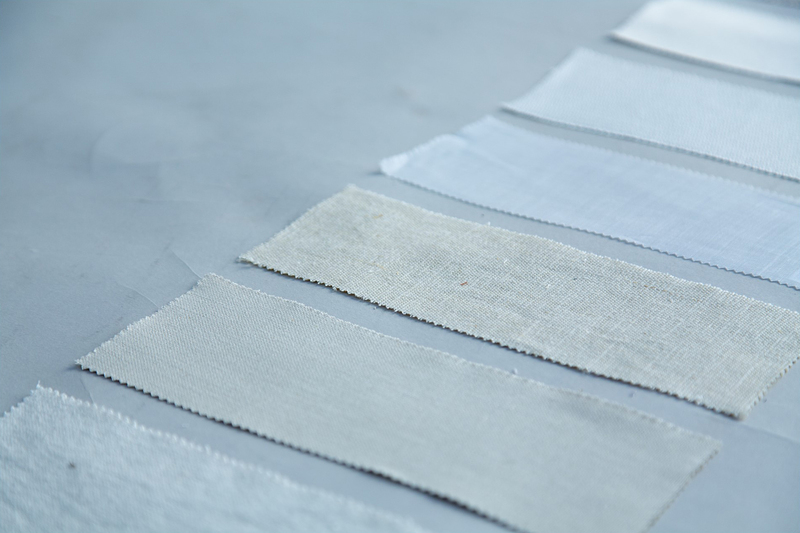 Natural tissues are produced from yarns whose fibres exist in nature, by means of mechanical processes, without undergoing any chemical processes which modify their structure. The yarns utilized are those of hemp, nettle, soy, bamboo, linen and organic cotton. Natural tissues, as well as having a beneficial and healing effect on the body, are dyed naturally with herbs and mineral dusts, involving ancient and traditional techniques. #!TRPST#TRP-GETTEXT DATA-TRPGETTEXTORIGINAL=13#!TRPEN#NOTE#!TRPST#/TRP-GETTEXT#!TRPEN#: These settings will only apply to the browser and device you are currently using.